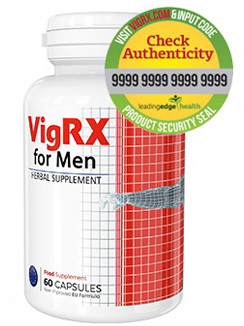 VigRX is a herbal food supplement that was created over ten years ago for men wanting virility enhancement. VigRX is a herbal food supplement that was created over ten years ago for men wanting virility enhancement. Manufactured in Canada, it is the number one selling product of its kind and has been so for many years. This item brings together a carefully researched blend of 8 natural ingredients that work together to help improve performance, stamina & endurance. Clever marketing techniques can get people buying a product for a while, but for VigRX to be the leading brand worldwide year upon year is because customers trust it and use it more than once. Well, for starters, VigRX was one of the first male enhancement products to come onto the European market, as it was originally released in 2001. You will struggle to find another item of this kind out there that has been around for as long as this has. In fact, many supplements have come and gone over the years, but it is really only our item that has stood the test of time. This might have something to do with the fact that following its release, this supplement quickly became the best selling item in its category and that this is a position it still holds onto today. Again, there are few other products available that can match how well established VigRX is. Over time, other related products were released such as VigRX Oil and VigRx Plus. However, VigRX is still the most widely used supplement. A lot of men turn to VigRX to help give them the confidence boost or the extra helping hand they need. The breakthrough for this supplement came after many years of research into the best blend of herbs. The combination of these herbs together with just the right amount of each element, gives you the formula. The premium quality natural sources are another factor that sets us apart from any competing brand. Male virility and enhancement is an important issue for so many men. Increasing blood flow around the body and particularly to the groin area is the goal. People that take VigRX comment upon how they can ‘feel’ the difference in the first instance before they notice any other changes. Everything in this item is made with completely natural ingredients and do not have any unwanted side effects linked to them. It is also suitable for vegetarians. How do you take VigRX? You are advised to take two capsules per day. In every bottle, there are sixty capsules giving you a month's supply. It is best taken with meals and a glass of water. Although this supplement is known to get to work straight away, you may not see any visible changes until the first month. Most men who use VigRX report seeing the full effects after 3 months of daily use.